So it’s London 2 – Manchester nil (enjoy it while you can London, you aren’t going to win the thing). The way modern football works, not only is being knocked out of the Champions League miserable enough, but the financial consequences aren’t great either, especially when you’re up to your eyes in debt. Lots of people have asked me about the cost of United’s CL exit, so here’s a quick run through of the figures. The bottom line is that due to the way UEFA makes its payments, with a big element relating to the last season’s domestic rankings, United will not lose a huge amount of cash compared to last year. I’ll make financial comparisons with last season when of course United were (well) beaten finalists. UEFA publish the TV cash distribution and its shows MUFC received €53,197,000 (c. £46m) in Champions League income. All clubs in the group stages receive a €3.9m “participation” payment and a €550,000 per game played “match bonus” (nonsensical since everyone is guaranteed six matches!). So every club gets €3.9m + (6 x €0.55m) = €7.2m. Last season United earned €16.1m as losing finalists. The market pool represents around 45% of the CL money UEFA distributes to clubs. Each country has its own pool amount (reflecting the relative size of the advertising markets). The English pool is c. €84m, around 25% of the total. Each market pool is distributed based on two formulae, 50% by the relative domestic league position of the clubs from the relevant country and 50% by how far in the CL each club progress. As Champions, United receive 40% of the Premier League finish element of the English market pool, Chelsea (2nd in the league) receive 30%, City (3rd) 20% and Arsenal (4th) 10%. This means that United receive c. €16.8m this season vs. the €12.5m they received last season (when Chelsea were the reigning champions). The 50% of the market pool determined by the relative progress of the clubs cannot be calculated for certain until we know how far through the competition Chelsea and Arsenal progress. The split is determined on the number of games played (maximum of thirteen for finalists). The minimum the London clubs could play is eight (if they go out in the next round). 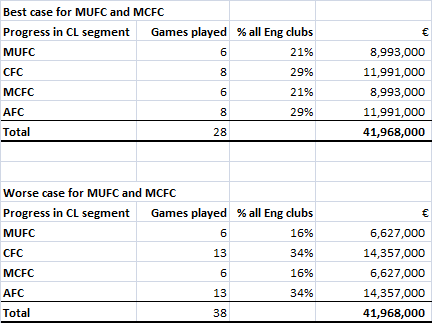 The difference for United and City between the best and worse case is not huge (around €2m). Adding up the group stage payments, and the market pool, the most United can earn from the CL this year is around €36.5m, the least is €33.4m. United and City will both get the dubious honour of being parachuted into the Europa League in the new year. The UEFA distribution for this beaten up tournament is less than 20% of what is paid out for the Champions League. There is a market pool and payments for progressing through each of the five(!) rounds up to and including the final. 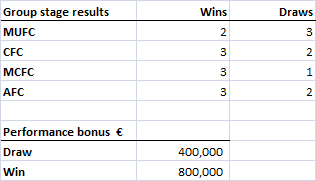 Winning the competition could add around €10m (there is a market pool here too). 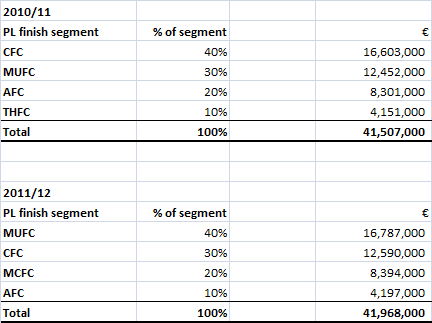 There are potentially four home games in the Europa league vs. three in the Champions League, so the impact on gate receipts depends on a few factors, primarily how far through the EL United progress. The club’s website does not have ticket prices for the Europa League yet, and we do not yet know whether the club will enforce the ludicrous “automatic cup scheme” that compels Old Trafford season ticket holders to buy tickets for all cup games (with an opt out only for the League Cup). If United enforce the ACS, if prices are set close to those for the Champions League and if United get to the quarter finals or beyond, there will be no impact on revenue. Because of the big market pool boost from being champions last season, United will only lose a maximum of £17m in TV cash from the early exit. Some of this can even be recovered from the Europa league. The club don’t budget to progress beyond the last sixteen in any season, so recent success has been a financial bonus. To put this loss into context, it represents a maximum of 15% of last year's EBITDA.